This is a repost from the Australian Atrium (Project Management) website and is aimed at Australian ZM members. This is a proposal regarding the Beyond Zero Emissions renewable energy proposal. Beyond Zero Emissions is a group of engineers and scientists who have created a proposal to convert Australia's energy supply to 100% renewable energy within 10 years. It is primarily done using a mixture of wind power and concentrated solar thermal. 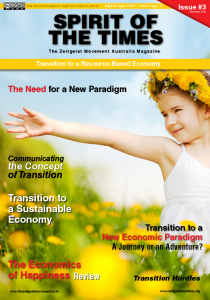 The Beyond Zero Emissions cause is very much in line with the Zeitgeist Movements aims and principals. We will need their help to prevent humanity from facing environmental and energy crises, whilst they need our help in order for the proposal to get traction. We are interested in helping promote and champion the BZE emissions scheme. In order to help us develop new project ideas we are working on a output centric approach. 1. You start off by writing the press release you would like to see. 2. You then write the FAQ. 3. If it's particularly complex you can even write a help manual. Only after you've gone through the above steps do you work backwards to find out what needs to be done/created and how.